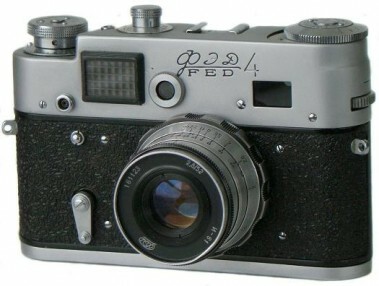 The Fed-4 were produced in two versions. The first model (reffered to as Fed-4 (a)) has wind knob and was modified from Fed-3 (a) to accept a light meter. 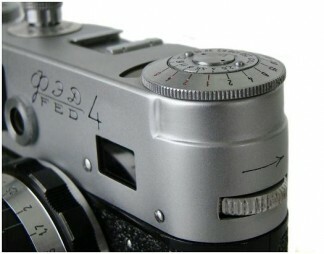 The Fed-4 (b) has much higher viewfinder assembly to add a light meter. The light meter control knob is where the rewind knob was so the rewind knob now sticks out of the side. 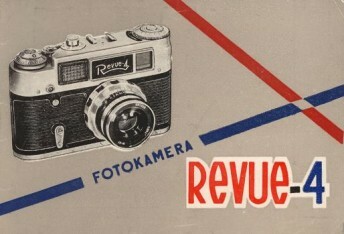 The Fed-4 (b) camera again was available with either single or dual lettering . Quantity: 633.096 units (all types). Type-1. 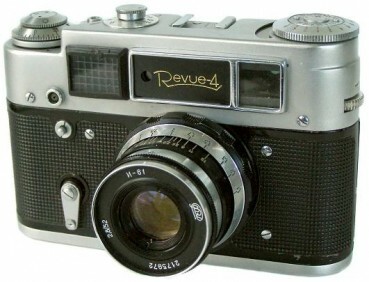 An earliest so far known regular version of Fed-4 camera. As it was already mentioned above, the particular version comes with shutter advance knob. An early form of top plate mouldings (see picture opposite). Strap lugs on body. Quite uncommon version, since only limited quantity released in 1964. 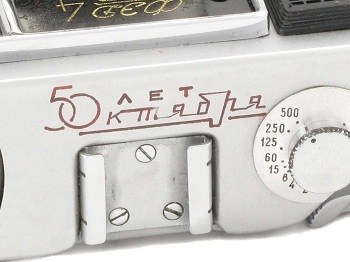 An earliest so far known camera has s/n #4000958 (SovietCams). Type-2. 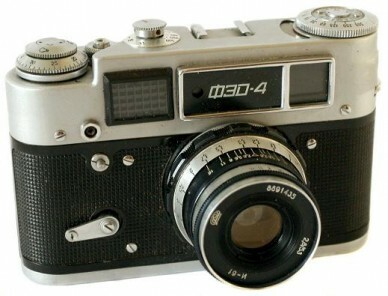 Quite common to find version of an early Fed-4 camera. Identical to type-1, but with new form of top plate mouldings. An early type (so called "Panda") of white Industar-61 lens. Strap lugs on body. 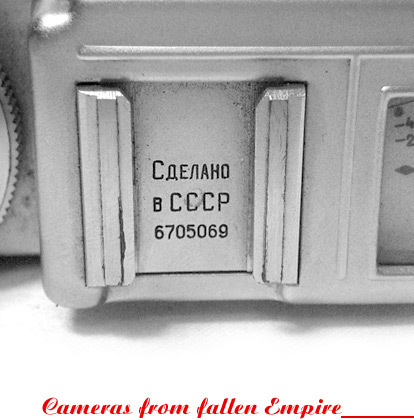 Some cameras have "Made in USSR" markings on the rear plate. Released in 1964-1965. Donative engravings in Cyrillic characters on the rear plate: "To Colonel Burij M.P. for achievements in military and political preparation from Ministry of defence of USSR. 1966". Type-3. Camera identical to type-2, but with new coding system in serial numbering. Prefix "64" now indicating cameras, released in 1965-1966. Probably this temporary coding was needed to start the usage of date prefix in 1966 ... 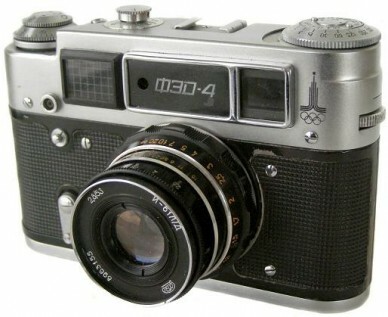 Almost all type-3 cameras have "Made in USSR" engravings on the rear plate. The Olympic version of particular camera. Less common to find. 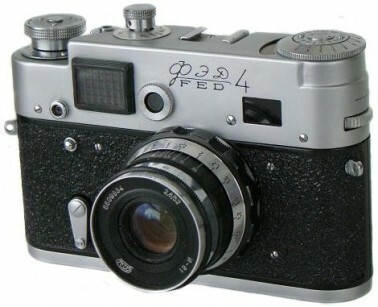 Although soviet camera industry produced a lot of commemorative cameras, only very few Fed's were among them. That's why an anniversary Feds becoming very scarce nowadays. 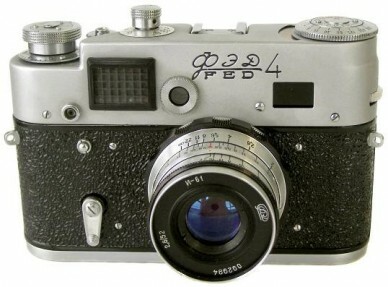 To commemorate the "Great October-50" Fed issued three cameras: Fed-3b, Fed-4b and Fed-11 Atlas with special engravings. 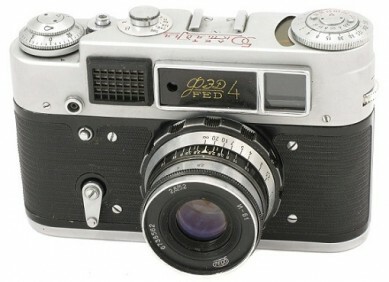 Beside this, the limited quantity of Fed-2 and Fed-3 cameras entered the market without "Great October-50" engravings, but with special anniversary boxes and "67" date prefixes in their serial numbers (both body and lens). 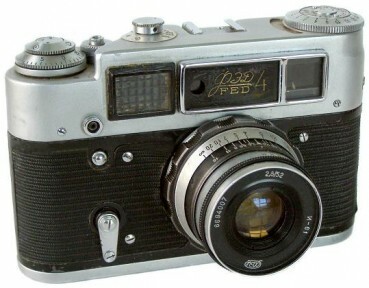 Although mass-market Fed cameras have no date prefix in their serial numbers, the commemorative Feds have special date prefixes "67" both on camera body and Industar-61 lens. 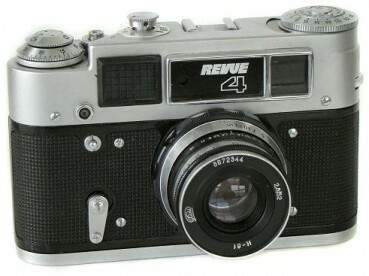 Camera identical to Fed-4 (b), under Roman name „Revue-4“. Western Germany market (Foto-Quelle). 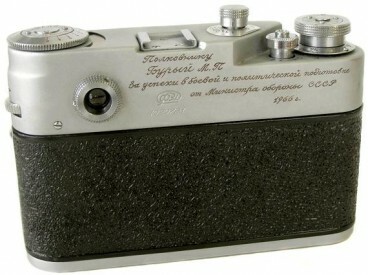 Camera identical to Revue-4 #8437648, but with different namplate.